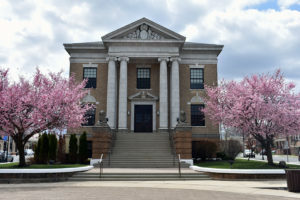 The Borough of Carteret Office on Aging is committed to ensuring that no person is excluded from participation in or denied the benefits of its services on the basis on their disability as provided by the Americans with Disabilities Act. The Borough of Carteret Office on Aging management, and all supervisors and employees share direct responsibility for carrying out the Borough of Carteret Office on Aging commitment to the ADA. The Borough of Carteret Office on Aging ensures accountability in this commitment, and supports all parts of the organization in meeting their respective ADA obligations. Coordinates internally with all appropriate offices in the investigation of complaints of discrimination, and takes a lead role in responding to requests for information about the Borough of Carteret Office on Aging civil rights obligations and operations. If you wish to file an ADA complaint of discrimination with the Borough of Carteret Office on Aging please contact the Borough of Carteret Office on Aging via 732-541-3890 or 61 Cooke Ave, Carteret NJ 07008, or use our online form (if applicable). What Happens to my ADA Complaint of Discrimination to the Borough of Carteret Office on Aging? All ADA complaints of discrimination received by the Borough of Carteret Office on Aging are routed to local area management for prompt investigation and resolution. All complaints received will be investigated, so long as the complaint is received within 180 days from the date of the alleged discrimination. The Borough of Carteret Office on Aging will provide appropriate assistance (online and otherwise) to complainants who are limited in their ability to communicate in English or require accommodation. Complainants will be requested to leave contact information for follow-up about their complaints. The Borough of Carteret Office on Aging aims to complete investigations into all complaints received, within 90 days of receipt. In instances where additional information is needed to complete an investigation, the investigator will contact the complainant using the contact information provided. Failure of the complainant to provide contact information or any requested additional information may result in a delay in resolution, or the administrative closure of the complaint. The Borough of Carteret Office on Aging has a zero tolerance policy on discrimination and will take appropriate corrective measures in all instances where a violation of the Borough of Carteret Office on Aging non-discrimination policy has been established. Once a complaint investigation is complete, complainants will receive a notice of finding via their preferred/available mode of contact (phone, e-mail, U.S. post, etc.). If no contact information is provided, a note regarding the outcome of the investigation will be saved on file for a minimum of three years. Complainants can contact The Borough of Carteret Office on Aging, customer service at any time to check on the status of their complaint. The Borough of Carteret Office on Aging recognizes that disabilities are as diverse as the individuals they serve and recognizes the need to make reasonable modifications to its policies, regarding assistance offered to passengers who may require additional assistance to use its services. Riders must inform the Borough of Carteret Office on Aging of the need and specific type of additional assistance requested at the time ride reservation is made. If the Director of Transportation deems the service requested to be unreasonable to perform or to repeat on a regular basis, he/she must cite specific reasoning to support the finding and inform the driver. If the Borough of Carteret Office on Aging concurs with the finding, the rider must be so informed via phone call at least 48 hours before the requested/scheduled trip. The finding must also be communicated to the rider expeditiously by written correspondence. Riders may appeal any such decisions by following established ADA grievance procedures. Complaints that a County program, service or activity is not accessible to persons with disabilities should be directed to Carteret Health Department.